A little more seasoning with that sensor, Sir? The first international factory for ingestible sensors, is to be built in the UK by US company, Proteus Digital Health. The factory will have the NHS and the UK Government as partners. Portable devices such as these are decentralising healthcare and will transform the way healthcare can be delivered in partnership with the patient. The technology is swallowed and the stomach fluids power the sensor by transporting it via stomach fluids. A body worn patch sends information captured to a mobile device. Such technologies have the potential to be transformative to healthcare, as the collection of data and mobile management tools enable diagnosis, faster assessment and more accurate treatment, linking the patient, their carer and clinician to help them stay well. The technology will become more affordable and convenient as specialists in consumer technology are conjoining with medical technology and identifying commercial opportunity. For an already overstretched NHS this sounds like a welcome IT technological advance. EE, O2, Three and Vodafone and the Information Commissioner’s Office (ICO) are working together to prevent nuisance text messages of spammers and fraudsters spreading across the UK’s four major mobile networks. This is being done by the mobile group signing up to the GSMA Spam Reporting Service. This will be coupled with mechanisms in real time to find the perpetrators. Those who have breached the Privacy of Electronic Communication Regulations (PECR), will have monetary penalties issued against them. In 2012, the ICO issued a £440,000 fine to two men running a spam texting operation. The GSMA platform will collate and analyse the details of users’ reported spam to id patterns and origins of attack. The collaborative aim of the group is to isolate and prevent spread to other networks. The ICO is also looking to extend this into nuisance calls. Vigilance against threats to mobile devices are an ongoing challenge for MSPs, as mobile workforces become ever more commonplace. Reducing fear and threat should certainly get the thumbs up from the marketplace. A group of MIT researchers have created a new platform for creating spy proof websites by building secure sites, services and applications, called Mylar. This is in response to the high profile Snowden leaks of government agency incursions in the USA to capture people’s private data and to counter the increase in identify theft and hacking efforts internationally. With Mylar, the data remains encrypted all the time in its servers and only decrypted when accessed from your computer, with correct password authentication. The system is being tested by a group of patients in the US to share medical information with their doctors and the designers are exploring their own chat, photo sharing and calendar applications. Whether this leads to a more commercial take up remains to be seen, as web providers may be reluctant to use a technology which restricts clients’ websites from accessing user data to serve targeted ads. One of Gartner’s leading Storage Technology and Strategist Directors, Valdis Fink, has been thinking afresh about how Cloud needs to develop, versus how it has been used. For organisations, a primary benefit of Cloud has been to shift capital costs to operational costs. SMEs who have had their own servers or back up options, are increasingly taking up the opportunity to outsource to secure data centres. However, data centres have remained the same with centralised grid computing architecture which has got larger and the offerings cheaper, so data (and apps) has essentially just been re-centralised elsewhere. Fink maintains that real cloud computing should be location and device independent, safe and accessible from anywhere, within the internet, on peoples’ computers and devices, in data centres and in hyper-scale data centres, using information dispersal algorithms. Such technologies are available today, which synch and secure. So the challenge for forward thinking MSPs is to drive the thinking, rather than follow major vendors to ensure your service is “leading edge” and right for your clients who have every right to expect the best. The first press engagement next week for new Microsoft CEO Satya Nadella, is rumoured to include an announcement for the long-awaited launch of an Office application for iPad. Any misgivings internally about this move weakening the Windows platform is put into context when set against the estimated gap in revenue that this dedicated app would bring of around $2.5 billion per year. Microsoft seem intent to ramp up the software onto as many platforms as possible having released applications onto iPhone, OneNote, Sky-Drive and Outlook for the iPad. 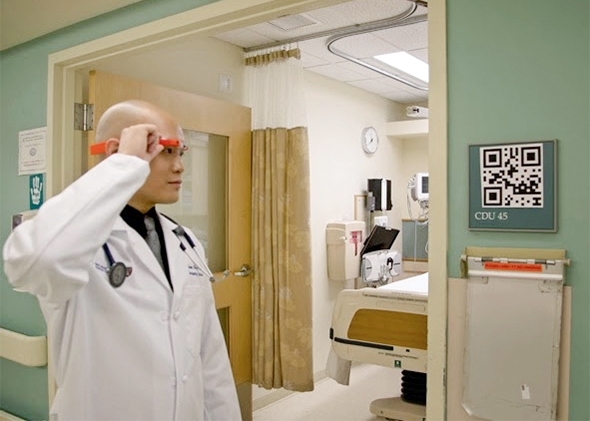 Wearable computing has moved one step further with the employment of Google Glass in a small pilot at the ED of Beth Israel Deaconess Medical Centre in Boston, USA. Clinicians wearing unmissable orange specs, would glance at a bar code or QR code and receive patient details, location, lab results and other data through the glasses during examination. The real time access to patient data through the glasses proved effective and life-saving during the pilot. Concerns about data security were satisfactorily answered with data being held behind the BIDMC firewall and patient reaction and clinician usability both got approval. With further testing ongoing, for limited or summarised information, the glasses have proved an effective compliment to current desktops and iPads in speeding up clinician workflow and enabling them to work hands free. The results will be closely monitored. The potential for wider adoption across the US and internationally is tantalisingly close, whilst the use of tablets in healthcare may see a decline if it takes off. 4th largest supermarket Morrisons, already facing a tough time in the UK press last week after announcing a sharp fall in profits, promptly endured a major security breach from a disgruntled employee, who published the payroll details of 100,000 of the company’s employees on a website including names, addresses and bank details. Clearly, the need to secure confidential data from rogue internal use vs the cybercriminal bogeyman is less comfortable, but of equal necessity to firms. This could have been the end of it, but perhaps the final lesson in what not to do, came with the retailers choice of messaging to inform and reassure staff about the data breach via social media behemoth, Facebook. In this digital age, HR departments have the powerful and certainly more private tools of email and text to communicate private messages to staff. Perhaps if they had done this, it would have kept the last vestiges of their laundry from being aired quite so publicly. Google has created an Android Wear mobile operating system to power smart watches. This smart strategy ties in with its move into robotics, Google Glass and data analytics. As intelligence conjoins through Google Now, the company’s PA software, this helps inform and interact with the user to provide a more effective experience for the information and services received. Globally, this strengthens Google’s wearable technology offerings promised in 2014, but they will not be on their own, as Motorola has announced it is launching the Moto 360 smart watch to run on Android Wear too. Working with several consumer electronic partners including Samsung, Motorola, Asus, LG and HTC, plus chip makers, Google is ensuring that if it builds out this particular technology wardrobe, that it wants its software across as many devices as possible as the Android platform goes beyond today’s smartphones and laptops. MEPs this week voted overwhelmingly to tighten up new data protection laws in the “Data Protection Regulation”. Justice Commissioner Viviane Reding commented: “This reform is a necessity, and now it is irreversible…”. She added: “Strong data protection rules must be Europe’s trade mark. Following the US data spying scandals, data protection is more than ever a competitive advantage”. This was echoed in a speech by Euro Commission VP Neelie Kroes who said: “The next phase of the internet will be data-centred and connectivity-driven. Cloud computing, big data, the internet of things; tools which support manufacturing, education, energy, our cars and more. It is no longer about emails. In this new world, reliability and trust is a pre-condition”. These changes will be especially hard for smaller businesses to manage and could cripple them with onerous administrative responsibilities. However, for MSPs there is a clear opportunity to sift through the complexities by providing proper consultative and support services to ensure companies and individuals are better protected. Not long ago, Facebook started utilising Blu-rays for a low powered storage solution. This was done with a customised solution holding 10,000 Blu-ray discs. However a much more efficient and practical solution is on the horizon. Sony and Panasonic have teamed up to create the next generation of disc-based media called Archival Disc. This goes far beyond Blu-ray, storing up to 1TB of data per disc (the equivalent of 250 DVDS or 40 Blu-rays). With this much storage on such a slim profile, Archival Disc’s could genuinely change the way we think about corporate data backup. Compared to tapes these are much easier to store and secure. The only unknowns so far are speed and cost. The first discs are due out in 2015 in 300GB variety, with 500GB and 1TB versions rolling out at a later date. Wireless charging technology has been creeping into the mainstream since launching in 2009. Mostly used as a cable-free way to charge your smart phone at your desk. Like all emerging technologies there is a lot of money to be made and big tech companies will fight to have their version of the technology become the universal standard. The two big names in wireless charging are Qi and PMA. PMA have managed to catch some big contracts like AT&T. The communications giant has been controlling mobile phone manufacturers to force use of the PMA technology instead of Qi. Qi on the other hand has penetrated the market more and won over move mobile phone manufacturers with Nokia, Google, Samsung all mostly using Qi. The latest news in this battle of wireless technologies brings tech giants Microsoft and Samsung to the QI board. This emphatic demonstration of commitment shows not only their support of the technology but also the drive for its wholesale adoption. This could be the fatal blow to PMA, whose product could soon end up in the bargain bin where HD-DVDs were just a few years ago. The UK has become one of the world’s pioneers in implementing 3D technology in surgery. Nowhere is this better demonstrated than a recent pioneering operation in Wales, where a motorbike victim had reconstructive surgery to his face, using 3D printed parts (including custom printed models, guides, plates and implants), months after the accident. The speed with which this technology has been adopted for surgery is remarkable. It is in stark contrast to the news in 2013 when 3D printers were first used to print guns in the States. Criminals unsurprisingly have also found uses for the technology, notably creating card readers (“skimmers”) to steal money from ATMs. Consequently, police organisations have set up dedicated departments to monitor cyber-crime alongside emerging technology. But at least on this occasion, the outcome is a wholly positive one for everyone involved. Microsoft has made a simple change to Windows Enterprise licensing that could see even more organisations taking the plunge. Previously the only way to obtain Enterprise was to purchase and attach Software Assurance (SA), typically lasting 2-3 years to a Windows Pro device. Now, for the first time – Windows Enterprise Upgrade license is available for direct purchase from Microsoft, without the need of additional Software Assurance. This does not affect how OEM sell you Windows on a machine, so you won’t be seeing Enterprise pre-installed on machines anytime soon. The support advantages of SA are still there is you do decide to go down that route. At the end of the day we now have some more flexibility in terms of pricing and support for Windows Enterprise, good news all round. Last week saw Nokia announce 3 smartphones, all running Google’s Android platform, a first for Nokia. As Nokia’s phone business will soon be owned by Microsoft, who will see themselves selling a competitors OS for the first time. Microsoft of course was aware of this peculiar operation before the announcement. The Nokia-Google phones are all designed to fit into the modern Windows look and comes built in with Microsoft services such as OneDrive, Outlook and Skype. The strategy here is to lure android consumers over with the Nokia brand and app compatibility and then get them hooked on the modern Microsoft ecosystem, making their next purchase a Lumia or other Windows Phone. A risky strategy to be sure as users could also upgrade to another Android phone but a bold move nonetheless. Where Will Wearable Technolgy Go? 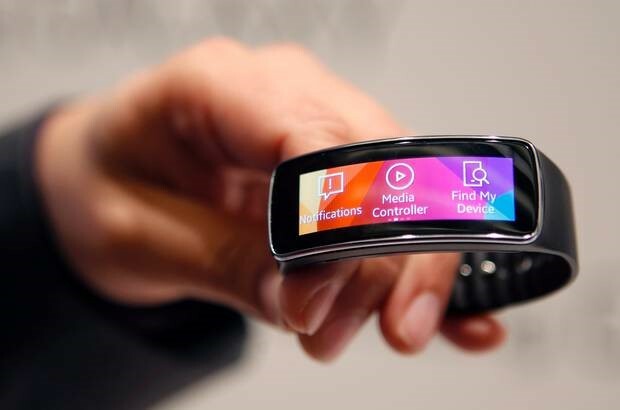 Following a trend to take mobility that one step further, Samsung has released “Gear Fit”, a slim, lightweight wristband with curved OLED colour screen at last week’s Mobile World Congress. Targeting the fitness market initially to track activity, it compliments their multi-tasking smartwatch “Gear 2” which works with Galaxy’s smartphone to make and receive calls. The logical next step is technology embedded in clothing which when placed near to the heart becomes a monitor. Issues to consider apart from being mugged, are the threat of hacking with someone having access to your personal health data. Implementation of personalised Firewall software will be required and then telehealth can look to set some fashion trends too – and still possibly be ahead of Apple and bite a chunk out of their marketplace to make compatible for iPhones.